During my trip to Stamford with my X-Pro2 last weekend I shot in raw and processed everything through Adobe Lightroom, as I normally do. However, one of the strengths of Fuji’s X System cameras is their in camera jpg production. So why don’t I shoot jpg more? I’m sure there are several reasons. One is that I want to make sure that I retain the raw data from the sensor which provides me with everything I need to process the image in whatever way I want. Another is that maybe I’ve got too used to fiddling around with raw files? I now seem to see this as an essential part of the production of “A Photograph”. I have been shooting raw for about 11 years now, maybe I’ve got a bit stuck in a rut? Every now and again I’ll go through a stage of shooting raw + jpg but I invariably end up messing around with the raw version and not touching the jpg. Maybe it’s time I revisited jpgs straight out of the camera? The X-Pro2 offers dual memory card slots so I can shoot raw to one and jpg to the other. I’ve also had a long term quest for obtaining really nice contrasty black and white photos straight out of the camera. I’d got to a point where I was happy enough with the black and white settings I was using on my X100T. But now Fuji have also given us the Acros film simulation to enjoy on the X-Pro2. So yes, maybe now is a good time to start shooting raw + jpg again. Another very handy feature of the X System cameras is the ability to copy a previously shot raw image file from your computer back to a memory card, pop said memory card into the camera and then use the camera’s built in raw converter to create a jpg. This is what I’ve been playing with a little this evening. 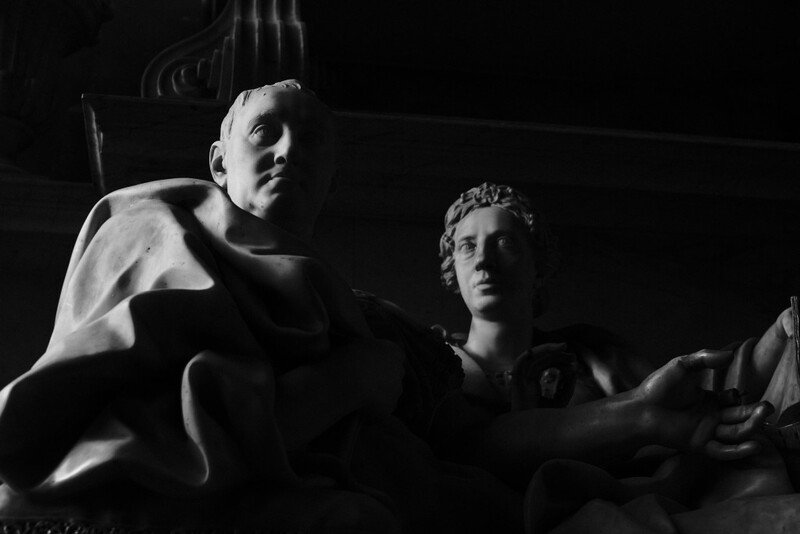 I took some photos of a monument in a church in Stamford which felt might benefit from the Acros film emulation. I copied the file back to the camera and fiddled with the raw conversion settings. I was particularly interested to see how the “film grain” effect looked so I processed the photo twice with the same settings but added some “weak” film grain to the second version. It’s interesting to see how much of a difference there is in file size when you add film grain. There’s more “detail” in the image so the jpg can’t compress so well. Straight out of the camera the version without grain was 6.36MB, the version with grain was 15.1MB. A scaled down copy of the version without grain heads up this post. I would have uploaded the full sized versions but WordPress kept reporting an upload error. I suspect the files were larger than some limit set somewhere in the system. However I’ve also produced a couple of 100% crops from the original jpgs, just to show the film grain effect and these can be seen below. I’m quite impressed with the film like grain structure and I’m looking forward to having more of a play with the Acros simulation. It certainly produces the kind of high contrast black and white that I enjoy so much. And do you know what else I discovered? I really do actually prefer the jpg straight out of the camera to the one produced by me sat tinkering in Lightroom for… however long it took. I think there might be a lesson in there somewhere. 100% crop of Fuji’s Acros film simulation – no added grain. 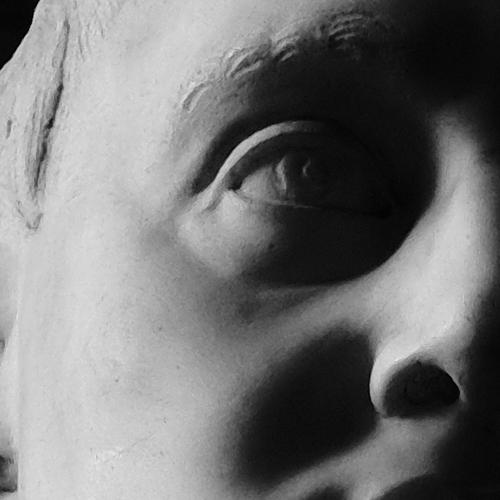 100% crop of Fuji’s Acros film simulation – added “weak” grain. just in here for a stroll through your photo’s and blog. Glad to see you’re out and about with your camera again. Good to hear from you Sven. Yes, I still need to get out shooting more. Also need to do a lot more work on getting this blog to have all the features I want it to have. Feels rather strange starting all over again but I think it’s for the best in the long term. Concentrate on one subject.